Anyone walking down Shields St recently may have noticed an unusual shop front window display. 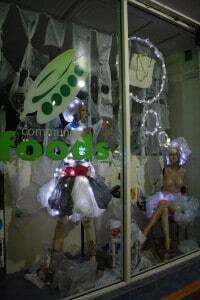 The enticing, glowing world of plastic on display at Community Foods is an art installation created by local artist Kevin Mayo as part of the Think Outside the Bag project. The Think Outside the Bag project is being run by theCairns and Far North Environment Centre in partnership with Tangaroa Blue and the Douglas Shire Sustainability Group. The aim of the project is to reduce use and trial a phase out of plastic shopping bags. The installation is on display at Community Foods, 74 Shields St, Cairns. Find out more about the THINK OUTSIDE THE BAG project. Many thanks to Crackerbox Palace for their assistance with this project.